About a year ago, Jim Bullard criticized the argument that that the Fed was missing on both sides of its dual mandate. Mark Sadowski (who should have his own blog, I think) has asked me to post his reply. I am most happy to do so. “Bullard suggests that a non-monotonic transition path for inflation is unlikely to be part of any optimal path in a NK [New Keynesian] type model. The optimal path for inflation is unlikely to be part of any optimal path in a NK type model. The optimal transition dynamics are typically monotonic—think of the optimal transition path as a movement back up the PC [Phillips Curve] in the diagram above. If this is true, then the optimal transition path necessarily has the Fed missing on both sides of its dual mandate. Sumner is of course talking about the contractionary portion of the U.S. Great Depression. The subsequent 1933-37 recovery, during which real GDP grew at an average rate of 9.5%, is an excellent example of “oscillatory convergence” with unemployment high and falling and inflation higher than normal. And yes, monetary policy is generally regarded as excellent during that period. Andolfatto’s, Bullard’s, and Sumner’s comments raise a great many questions. For example, what is the relationship between unemployment and inflation? How has this relationship changed over time, and why? How has this relationship been modeled over time? How should this relationship affect the conduct of monetary policy? For the moment, at least, I want to stay focused on Bullard’s remarks. “Let’s consider the medium-sized macroeconomic framework of Smets and Wouters (2007). This is an important benchmark model; and, while we could argue about the details, I think it will serve to make my point. In the Smets and Wouters dynamic stochastic general equilibrium (DSGE) model there are many shocks, and there is a monetary policymaker that follows a Taylor-type monetary policy rule not unlike ones used in actual policy discussions. The authors estimate their model using postwar U.S. data, and they also report results for subsamples including the post-1984 data. Importantly, what the authors are estimating is a general equilibrium for the economy, which includes monetary policy. How does the economy adjust in the Smets and Wouters model? The chart is Figure 2 from their paper. The authors plot the reaction of key macroeconomic variables to three types of shocks in their model that might be thought of as demand shocks. Variables are reported as deviations from a steady-state value, so that zero represents a return to normal. The variables include inflation and a labor market variable—hours worked. Time is measured in quarters. The shock is a positive one—output and hours go up in response—but the story is merely transposed for a negative shock (i.e., flip the figures upside down). The monetary policy reaction function that is built into the Smets and Wouters (2007) model is the original rule John Taylor proposed in 1993 ("Discretion versus Policy Rules in Practice", Carnegie-Rochester Conference Series on Public Policy, Vol. 39, December 1993, pp. 195-214), namely a Taylor Rule that places equal weights on the inflation gap and the output gap. In 1999 Taylor discussed an alternative version of this rule that placed double the weight on the output gap than on the inflation gap, (“A Historical Analysis of Monetary Policy Rules”, Monetary Policy Rules, Chicago: University of Chicago Press, pp. 319-341). This is a point to which we shall return later. Thus the response of the economy to the demand shocks illustrated in Figure 2 is conditional on the Taylor Rule embedded in the model. At this point it might be worth mentioning that one of the acknowledged shortcomings of medium-scale New Keynesian DSGE models is that typically there is no reference to unemployment. Bullard infers the impact of a demand shock on unemployment from its effect on hours worked. In particular, the Phillips Curve in the Smets-Wouters model is a hybrid New Keynesian type in which inflation depends on past inflation, expected future inflation, current price mark-up and a price mark-up disturbance. Apparently the only reference in the model to the output gap occurs in the model’s monetary policy reaction function (i.e. the Taylor Rule). “One approach I find helpful in judging an appropriate path for policy is based on optimal control techniques. Optimal control can be used, under certain assumptions, to obtain a prescription for the path of monetary policy conditional on a baseline forecast of economic conditions. Optimal control typically involves the selection of a particular model to represent the dynamics of the economy as well as the specification of a "loss function" that represents the social costs of deviations of inflation from the Committee's longer-run goal and of deviations of unemployment from its longer-run normal rate. In effect, this approach assumes that the policymaker has perfect foresight about the evolution of the economy and that the private sector can fully anticipate the future path of monetary policy; that is, the central bank's plans are completely transparent and credible to the public." In that speech Yellen describes how projections generated by FRB/US, the Federal Reserve’s primary forecasting model, were adjusted to replicate the baseline outlook constructed using the distribution of FOMC participants' projections for unemployment, inflation, and the federal funds rate that were published in January of that year. A search procedure was used to solve for the path of the federal funds rate that minimized the value of a loss function. The loss function was equal to the cumulative sum from 2012:Q2 through 2025:Q4 of three factors: 1) the discounted squared deviation of the unemployment rate from 5-1/2 percent, 2) the squared deviation of overall PCE inflation from 2 percent, and 3) the squared quarterly change in the federal funds rate. She termed this path the “optimal control” path. The 1993 Taylor Rule calls for the federal funds rate to begin rising in 2013Q2. 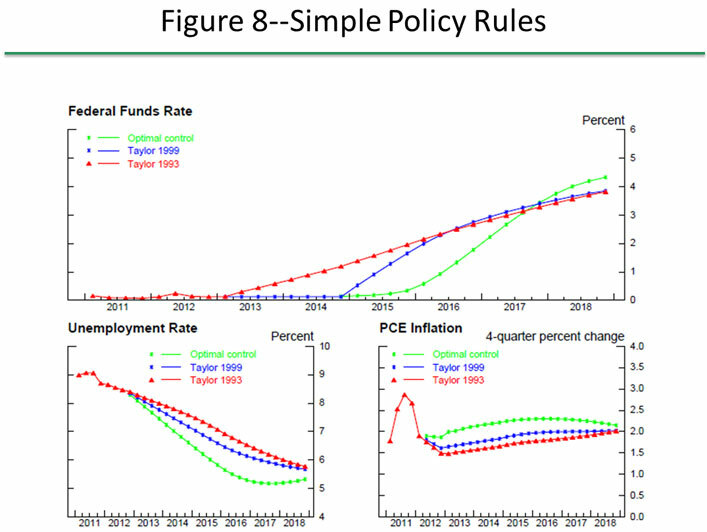 The 1999 Taylor Rule calls for the federal funds rate to begin rising in 2015Q1. Optimal control calls for the federal funds rate to begin rising in 2015Q4. More importantly, note that whereas the paths for unemployment and inflation under the Taylor Rules converge monotonically, under optimal control they display oscillatory convergence, with both unemployment and inflation “overshooting” before converging to their long run values. Now, it’s true these results were generated with FRB/US and not the Smets-Wouters model. FRB/US is a somewhat older (1997), large-scale simultaneous equation macroeconometric model. But because expectations of future economic conditions are explicit in many of its equations, and adjustment of nonfinancial variables is delayed by frictions, it too is often described as New Keynesian. The dynamic adjustment of its aggregate price equation means that, like the Smets-Wouters model, inflation is dependent on past inflation, expected future inflation and the current price markup, as well as number of additional variables such as the unemployment rate, energy prices, etc. And the general effect of monetary policy shocks on output, inflation and interest rates is quite similar to the Smets-Wouters model. Thus I expect were one to investigate optimal control monetary policy assuming credible commitment using the Smets-Wouters model, as Bullard mentions the possibility of in his footnote, one would probably find results similar to those generated with the FRB/US model assuming it were subject to the same loss function. To be more explicit, under the same assumptions, an optimal control path generated by the Smets-Wouters model would very likely exhibit the same oscillatory convergence pattern of unemployment and inflation as demonstrated with the FRB/US model. Thus it seems to me that the primary issue here is not what type of model should be used, but what the goals of monetary policy should be. Should monetary policy be guided by simple rules, such as the Taylor Rules, because in the past, and under potentially very different conditions, they were considered optimal? Or should monetary policy be more explicitly guided by the mandates to which it is legally subject? Or, indeed, should monetary policy be guided by something else entirely?